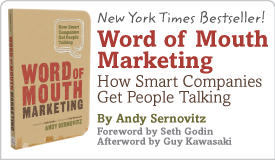 The Meat(ball) of the Matter: Give people something to talk about | Andy Sernovitz | Damn, I Wish I'd Thought of That! Average movie attendance drops 42% after the big opening week –but Cloudy With a Chance of Meatballs only dropped 19%. Word of mouth was clearly pushing the movie. When you get this kind of excitement you need to fuel it. How? By giving people something to talk about. Sony did a great job by making a huge amount of footage available on YouTube. Bloggers love video because it make blog posts look better, and it gives them something to talk about. “I love the movie” makes a pretty short post; a video makes it interesting. Sony also did a PSA video and kids’ site asking viewers to support hunger relief — a very smart tie-in, with real benefit to a worthy cause, Feeding America. They should take it to the next level by offering every food bank in America the opportunity to do a fundraiser. Each food bank gets to sell tickets to a private showing at a local theater — and keep all the money. Food banks would raise thousands of dollars, and the movies would get thousands of fans. The question to you: If your fans want to tell their friends about you, do they have enough to say? What could you give them?